São Bento railway station in Porto has one of the most unexpected interior decoration schemes of any twentieth century station. It is carried out in the medium of ceramic tiling. Though we’ve already looked at some British examples of tiled railway maps at stations in this earlier blog entry, São Bento station takes things to another level completely. Ready? It’s quite something, isn’t it? 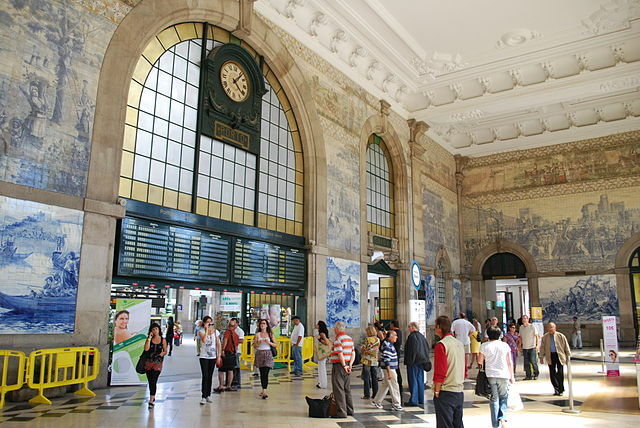 From the outside, São Bento station belies little of its extraordinary internal decoration. It’s a perfectly pleasant Beaux Arts building, though nothing obviously special. 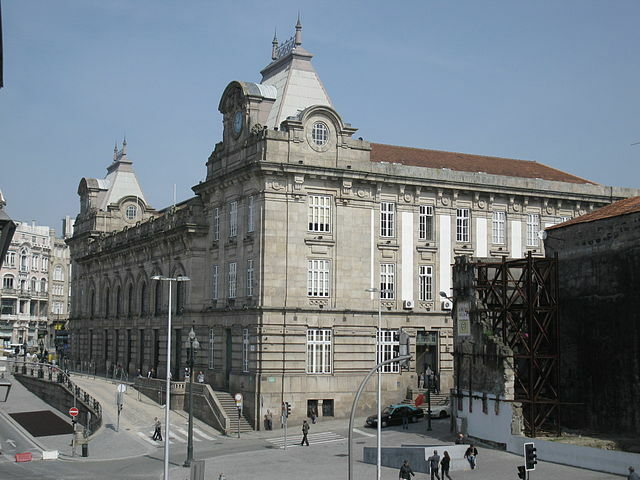 It is an early work by architect José Marques da Silva (1869-1947), and it opened for business in 1916. The real fun at São Bento station, however, is all on the inside. The use of ceramic tiling has been popular in the Iberian peninsula for centuries. It is frequently used both on the inside and outside of buildings, especially towards the south. Apparently the tiles have helpful thermal properties, keeping rooms cool in the hot climate. The use of tiling in the region dates back to the Moors, who invaded the Iberian peninsula in the eighth century. The Moors had something approaching a fear of bare interiors (it’s a good job Sir Terence Conran and Habitat weren’t around at the time, then) and decorated the walls of their buildings with coloured ceramic tiles featuring intricate geometric patterns. Some can still be seen on historic buildings in both Portugal and Spain. Long after the Moors left what became Spain and Portugal, the local inhabitants continued using ceramic tiles on their buildings, and they still do to this day. The interior design of São Bento station can hardly be described as geometric, however. If you know your European history, you’d be more likely to wonder what such tiles are doing in Porto, when they look rather more like Delftware than anything else. 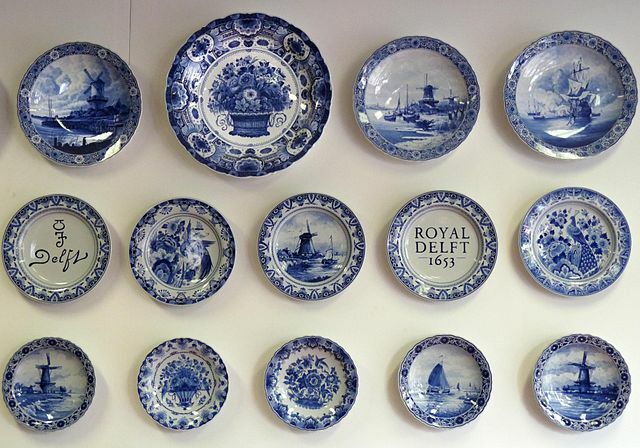 Delftware was developed in the Netherlands during the sixteenth century, with blue pictures painted on white porcelain. Although today it’s probably the tableware that most people associate with Delftware, in fact ornaments and tiles were widely available too. The Dutch exported their Delftware worldwide, including (eventually, by the seventeenth century) to Portugal, where it found a ready and enthusiastic market. Fashions in ceramic tile decoration had already been through several changes in Portugal since the geometric patternings of the Moors, including the development of “azulejo”: painted tiles with a tin glaze. In a gigantic cross-cultural collision catalysed by ceramics, Delftware-style designs made the leap from tables in the Netherlands to walls in Portugal. The Portuguese king of the time (clearly no fan of free trade) soon acted to stop imports from the Netherlands, and domestic artists took over production of these blue-painted white ceramic tiles with a tin glaze. 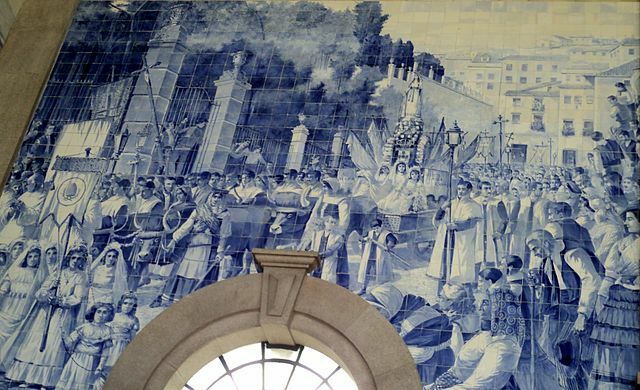 It is to this school that São Bento’s interior decoration belongs (although the frieze round the top is in full colour rather than just shades of blue). 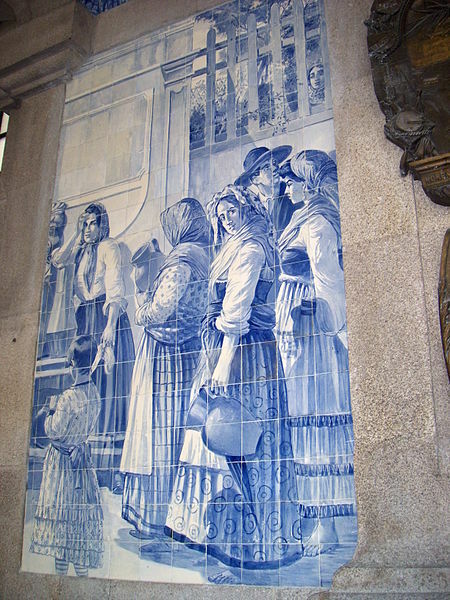 The tiling was created by Jorge Colaço (1868-1942), one of Portugal’s foremost azulejo artists. His work can still be found in public buildings across Portugal and at selected locations in other countries, including Windsor Castle in the UK. 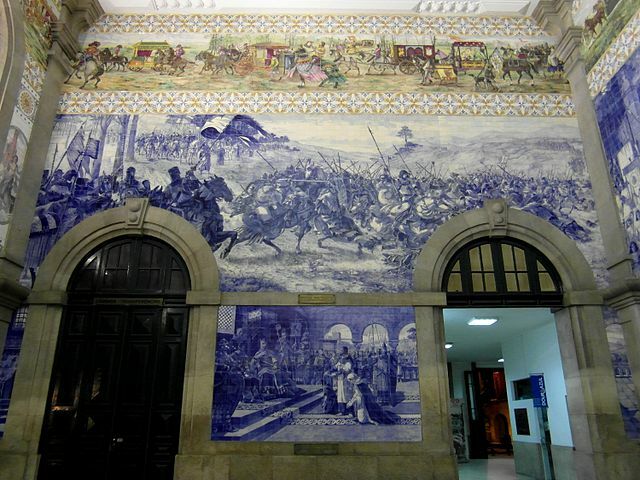 The panels at São Bento station feature views of Portuguese history, landscapes and people and give it a quite remarkable interior ambience (you can see a 360° panorama of the station’s interior here). Standing in the main hall of São Bento station is a bit like being inside a gigantic crockery cabinet. That’s not an experience you get very often on public transport, or anywhere else for that matter, making it a worthy entry onto the list of transport beauties. Delftware and ceramic artists are quite a way outside my field of expertise so I leant rather heavily on Wikipedia entries for both this week. I agree! But they’re not mine – click on the hyperlink in the captions and you’ll get to the Wikimedia Commons page for the photo. You might be able to drop a line to the actual photographer and tell them you you like their work. And of course, just out of it there is the D line of the Porto Metro crossing over the Eiffelesque Dom Luís I Bridge, both of which would definitely deserve more than a passing citation. It is a stunning building isn’t it . . . and you have some fabulous photographs. Must admit thought I was surprised you have not said more about the amazing transportation ones in the frieze right at the top of the panels. I think those are my favourites! I just wish i had got more and better photographs of them all when I visited earlier this year – good excuse though I guess to go back!